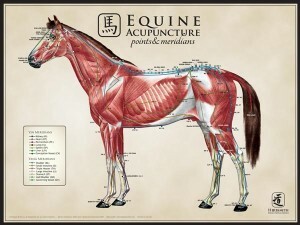 Display this beautiful poster in your clinic as a unique, educational piece of artwork that doubles as a quick reference! 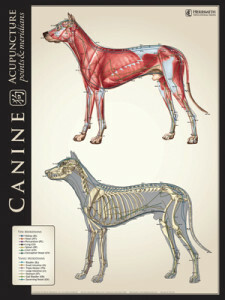 Depicts IVAS certified points on multiple views of the canine over both muscle and bone. Measures 18″ x 24″. 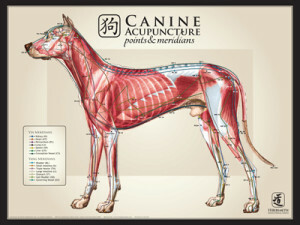 This set of charts features full color illustrations displaying IVAS required acupuncture points and meridians in relation to skin, muscle and bone structures. 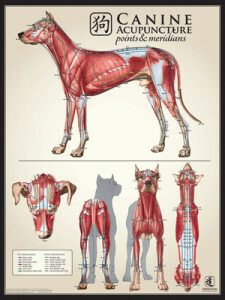 Meridians and points are individually labeled and color coded, displaying their Yin and Yang properties. 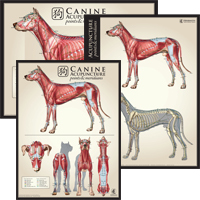 Charts are printed on sturdy, coated paper, folded and tabbed for quick reference. 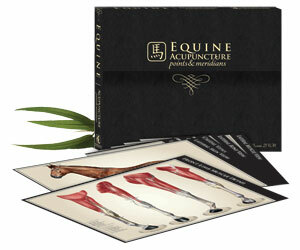 Collected in a beautiful case reminiscent of a leather-bound book. 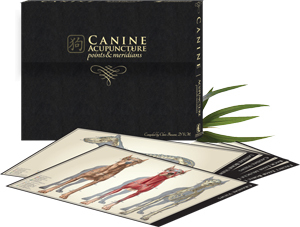 Order with Canine Acupuncture Points & Meridians Charts and save 20%! 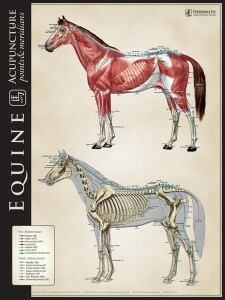 Display this beautiful poster in your clinic as a unique, educational piece of artwork that doubles as a quick reference! 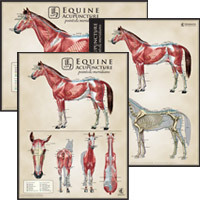 Depicts IVAS certified points on multiple views of the equine over both muscle and bone. Measures 18″ x 24″. 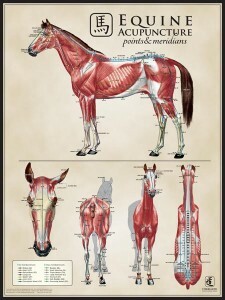 Display this beautiful poster in your clinic as a unique, educational piece of artwork that doubles as a quick reference! 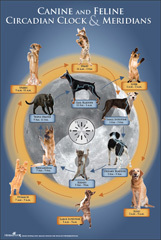 Depicts the directional and time flow of Qi as well as meridians in cats and dogs. Colorful, attractive, easy to use, and based on the traditions of Chinese medicine, this chart classifies grains, vegetables, herbs, nuts and seeds, fish, fruit, etc. according to action, entering channel, temperature, flavor. Notes on chi, blood, yin and yang, tonifying and regulating foods, help to make this useful as well as decorative. Note: See the accompanying book, Helping Ourselves: A Guide to Traditional Chinese Food Energetics. Like its sister chart, the Guide to the Energetics of Food, this new full color chart is attractively designed and matt-laminated. It displays information on about 150 Western herbs, outlining their energetic properties in the language of Oriental medicine. It will be of use to all those with an interest in Western herbs, whether professionally or otherwise, and is another significant step in bringing the wisdom and understanding of Chinese medicine into the Western world.